A mate of mine gave me this thing ,no idea what its off ,any one recognise it ? Aluminium frame ,well made . Removed the bellows for a look see . Plasma, router, not much difference. It could be made to do either but for a router you would need a Z axis and that beam might be a bit skimpily built to support one. Hard to tell from pictures. Plasma would be easier and then you just want of those controller that Joules was playing with. Ignore that Mawson bloke, he's only jealous. It's not been used as a router theres no sh*t / dust in the bellows , take it from me ruter dust is hard to get out completly . The motors are 1980's style 4 wire ? They are pre hybrid (modern motors) The frame looks like it came out of a light sensitive environment with it's dark anodised finish. I got a hit on Hewlett Packard using these motors in a gas chromatograph, so it's most likely high end stuff that this came out of. Wonder what the switches on the belts are for in pictures 5 & 6? Stop switches for loose tension on the belts? Woop woop. i see a new fancy Plasma table! Thanks! Figured on the slack belts, but not the broken ones. Neat idea! To be honest I am not sure I have the free time to do anything with it . so so much going on I still have all this lot to go at that I got 6 years ago . I would throw away those flexible couplings and use something more substantial if I were building a machine from those parts. I've seen several reports of the springy bit cracking in use and causing difficult to trace problems down the line. The three piece aluminium and plastic couplings are almost as cheap and are less likely to fail. I agree with the first bit but not the second. The alloy and plastic couplings, often known as lovejoy coupling are not guaranteed to be backlash free plus they can only handle misalignment in one plane. The only coupling that is backlash free and can handle misalignment in two planes is the Oldham coupling. Its attention to detail like this that turn a mediocre conversion into a good one. Problem in someone foits a set of lovejoys and posts the pics and everyone follows suit. There are other types accommodating misalignment in two planes John. This is a photo of an assortment from my coupling drawer. The four on the left are all zero backlash and allow slight misalignment in two planes and angular misalignment. They tend to be very expensive but, in my experience, are used in the applications requiring greatest accuracy and reliability.There are versions of this type of coupling with only one flexible driving plate - these are cheaper but only compensate for angular misalignment. Your favoured Oldham coupling (3rd from L on top row) will accommodate much more misalignment but it can come at a cost of lifetime. The more off-axis the motor and leadscrew the more sliding between the three parts and therefore wear and eventually backlash. 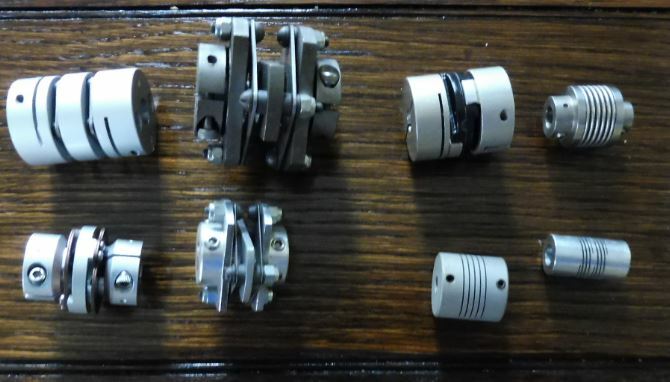 They are 'relatively' cheap and ideal for home CNC projects. The aluminium coupling at bottom right will take small amounts of misalignment in all planes but if they are not well aligned they will fatigue. They are also very springy so, if the table you are trying to move has any friction, a step or two at the stepping motor might well not move the table at all and just wind the 'spring' up. I agree that the Lovejoy type of coupling will only compensate for angular misalignment. Thanks for that Phil, may I copy and save this for future use with credits of course ?